It’s All In Da Juice, Baby! I LOVE this stuff. It’s in all the Yoga Glowing Body Detox Programs (comin’ soon) and an amazingly yummy detoxification juice…it’s got all sorts of goodness in it. Seriously. Here’s the skivvy on making it. You can play around with say Kale, instead of Spinach or add some ginger instead of mint for a little extra zip…just make it fun! This pose, 8-Angle Pose, was illusive to me for years. The more I tried to muscle my way in using brute strength, the harder it seemed. The strength to lift was relatively easy for me but the flexibility required in the hips and legs in order to fully access the pose…well, let’s just say it HAS to be there. In this pose both strength and flexibility in equal measure are needed. Here’s how to get into Eight-Angle Pose working your way up into the fullest expression of the pose. The preparatory poses are all about focusing on flexibility in the hips and hamstrings (so important) and strength in the arms and belly. Remember to work BOTH legs and have fun with this practice. It’s all about the journey, not the destination. One more tip…hold the preparatory poses way longer than is shown in the video. Aim for a good 1-3 minutes in each pose prior to going for the full on 8-Angle Pose. If you liked this video, please share it and leave a comment about what you liked best! ps…Are you a Beginner? There is something special for YOU over in the 4 the Love of Yoga Training area. Click Here >>> Yoga for Beginners <<< to check out the Yoga for Beginners Training Course. One of the things I love most about Ayurveda is that, each season has its inherent wisdom and offers us tools & teachings if we want to receive them. According to Ayurveda the season of fall to early winter is ruled by the elements of Air and Ether, which translate into the qualities of dryness, subtlety, movement & spaciousness. Common autumn imbalances are colds and flu-type illnesses, achy joints, dry skin, constipation, nervousness, and anxiety. As we become more attuned to the rhythms of nature we will find that we naturally begin to shift our diet and our activities to reflect the changes in season, and these changes allow us to synchronize with the new season so that we can avoid imbalances. When we are in balance, autumn becomes a time when we are most naturally drawn inwards and the mind becomes clear and we are capable of making decisions from a place of enhanced insight. It is the time of year when our minds most want to be nourished with knowledge and inspiration so it seems no coincidence that this is the season that we go “back to school.” This can also be a great time of year to undertake a new course of study or attend to creative projects. The higher levels of physical activity that are so natural during the long days of summer may seem too frenetic now and we naturally feel less of a desire to rush around. In fact, rushing and overfilling our calendar during this season can lead to a mind that feels un-grounded and a body that is tense and tight. As much as is possible try to avoid doing more than you need to each day and instead used the increased quality of focus that this season brings to become more efficient and organized in your actions so that there is some space for stillness in your day and your movements are not frenzied. Autumn is the key time during the cycle of the year to create and establish healthy routines and rituals, and it is the time where we will become the most imbalanced if our rhythm is erratic. Yoga fact: Downward Facing Dog isn’t always wonderful for your shoulders, hamstrings and low back. Sometimes, this “rest” pose can aggravate rather than alleviate. The yoga trick is to add in some adjustments to your downdog. These adjustments can be a little challenging (to change things up in your current practice) and/or they can be used to alleviate extra tension in the body. That, my friends, is one of my FAVORITE things about yoga! Remember the ultimate goal of Downdog is for the pose to feel like a little rest in the midst of your Vinyasa practice. It’s a pause, a place to catch the breath and get connected back to yourself. Forcing your heals to drop adds a lot of stress & tension in the low back which is the opposite of the effect we want in Downdog. Letting the head hang through and allowing the armpits to collapse downward adds extra tension in the elbows (yikes) and shoulders AND can even muck up your rotator cuff. So, here are some adjustments that are easy to implement. This video assumes that you ALREADY practice downdog on a pretty regular basis or are somewhat new to it and want to facilitate a little ease in the pose. Navasana is a big, warming, vigorous pose that I find empowering! There is nothing small about it and it’s a reminder to be the biggest best version of ourselves. Playing small doesn’t work in Navasana. Find a comfortable seat on your mat with legs extended. Root down into the mat with your sits bones (those two bony prominences that you sit on when seated). — modification: bring a folded blanket under the sits bones. This will help you stack your spine and grow taller as you root down with the sits bones. Blanket under the sites bones helps with any curvature that might present itself in the low back. Bend each knee and place the sole of each foot on the mat in alignment with your sits bones. Bring your finger tips to the mat (elbows pointing back) and lean slightly back keep the rooting action with the sits bones happening along with a long spine (no curving in the low back) – lengthen tailbone out the crown of the head. It’s important to check in here and see where your body wants to grip and hold. Try to breathe into those areas. Open your chest and relax your shoulders down. Lift the pelvic floor and pull navel to spine. Reach one arm forward, then the other. Keep a long spine and shoulders sliding down your back toward the sits bones. Begin to lift first one leg keeping shins parallel to the floor, then the other. Keep the knees bent to start with and check to make sure you aren’t rounding in the low back or crunching the shoulders to the ears. — modification: keep the feet on the ground or if lifted knees bent. You can also take the back of the legs/knees with the fingers if the arms aren’t ready to reach quite yet but remember to keep the strength through the core of the body and no rounding in the low back if you are holding the backs of the knees or legs with the fingers. Begin to straighten the legs. You might need to rock back just a little bit more but keep that spine long, and belly strong. Reach forward with the arms and spread those fingers wide. As you reach up with the legs and feet, try bringing the big toes together and spreading your toes wide. Remember you are reaching forward and up into the biggest and best version of yourself! Breathe! Find your long slow inhales and long slow exhales. Aim for at least 5 big breaths here. If at any point and time you feel anything unwanted or unhappy in your low back (remember we don’t want a curvy low back here), bend the knees or bring the toes to the mat. Beginners tip: Work the pose with knees bent and feet on the mat, arms reaching to start with. Once you feel super comfortable with 5 long inhales and 5 long exhales then move onward to lifting each leg but keeping the knees bent. Once this is easy, then move to the fully extended legs. Take it in small steps! Variation tip: to switch things up with this pose a little and get into the inner thighs, practice holding a yoga block between your thighs. This pose strengthens the deep hip flexors that attach the inner thigh bones to the front of the spine. Learn to anchor the heads of the thighs bones deep in the pelvis and lift from that anchor through the front spine. Remember that the lower front belly should never get hard. If you liked this pose and found it useful, please share it using the links below or leave a comment letting me know how this pose worked for you! This month has me thinking about strength & balance and one of my favorite poses that truly reflects this is one of the Warrior Series Poses – Warrior III (Virabhadrasana III). We need strength to keep our balance when things go awry in life. And doesn’t it seem like JUST when things are swimming along perfectly that something comes along that trows us off balance? Yoga not only gives us the strength to hold the pose but it also gives us the strength to show up and protect our kids, our crew, our tribe. Strength can be the capacity to accept where we are wholeheartedly and be happy or make the commitment to change what needs to be changed in order to move forward. It can mean speaking your mind, sticking up for what you know is right for yourself or for someone else. Being strong takes gusto, guts and fortitude. And that brings us to the secret of perfect balance – strength. It is strength that keeps us upright, standing tall, fully balanced – both figuratively and literally. It is mental fortitude and focus as much as it is muscle, fiber and bone. This is the perfect blend of strength and balance and good medicine for what life throws our way. Always start with some sun salutes to warm up. From Tadasana (standing tall at the front of your mat) bring your hands to heart center. Find Mula Bandha and Uddiyana Bandha (lift the pelvic floor – bathroom muscles/mula bandha & scoop your belly – navel to spine/uddiyana bandha). Keep your spine long and the core of your body strong using those bandhas. Hinging from your left hip just play around with what it feels like to start to lift the right leg out behind you (keeping it long) while allowing your torso to balance the weight of the lifted leg by moving forward (with long spine). Your leg and torso will work like a lever while you pivot at the hip of the standing leg. Keeping the two balanced is really helpful – as the leg lifts higher, your torso moves the equal distance forward. All the muscles of the standing leg will have to work to get into the pose this way. You might feel it all the way into the glute and hip. Once you’ve gone as far as is comfortable for your body (remember, everyone is different so if your leg is only barely lifted and torso barely moving forward, it still counts! ), begin to reach the arms wide or even long bringing your arms in alignment with your ears as you gaze down as your torso becomes parallel to the floor. Keep a long spine and check to make sure that pelvic floor is still lifted and navel is moving in toward spine. If your leg is fully lifted, square your hips (it requires a good deal of core strength to do this). Keep the knee of the standing leg soft so you don’t lock out that knee and hyper extend it. Allow your weight to be equal in the whole bottom of the foot that is on the ground (not just the inner or outer foot). Try not to grip with the toes. Stay there for 5 long inhales and exhales. Notice what throws you off balance and what makes you wobble. See if you can hang with whatever that is and STILL keep your balance. It can be tricky. Don’t give up. Keep practicing. Love yourself right where you are and be proud! Be sure to work both sides of your body (left leg lifted then right leg lifted) using the cue points listed above. If you normally get into your Warrior III from another pose like high lunge or standing splits (which is how I like to teach it) give yourself the challenge of working the pose from the front of your mat as listed above. You might find you get access to new muscles and can deepen the pose that way. Use a block or stack of books behind the leg that is lifting…you can touch your toes to the block for stability. You can also use a wall for this but you’ll need to be far enough away that the wall doesn’t inhibit movement. Grab a partner! Start facing your partner with your hands on their shoulders and their hands on your shoulders. Walk back bending from the hips until your arms and torso create a “table top” then lift your left leg using the cue points listed above. Be sure to do both legs! Use a chair for support. Place palms in the seat of the chair or on the back of the chair as you lift the leg. Just remember if you do this to keep your spine long, pelvic floor lifted and navel moving to spine. So…as always, let me know how it goes! What did you love about Warrior III and what part did you find challenging? Leave a comment below! 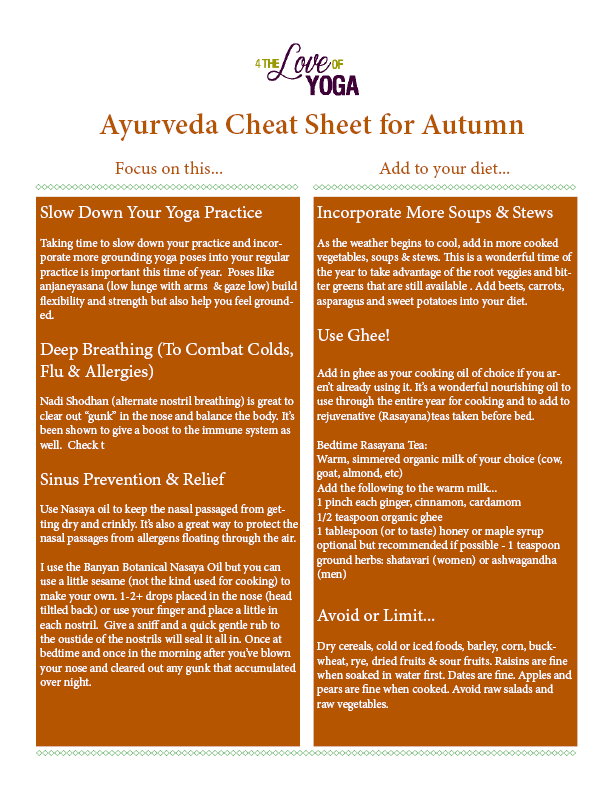 Did you know that Ayurveda is super beneficial in supporting your body during the change of the seasons? Spring is the PERFECT time to detoxify and slough off that extra winter cargo you’ve been carrying around. A detox is also helpful in relieving allergies and sinus issues that tend to arrive with the change of winter into spring. The food intake should essentially comprise of light and easily digestible foods. The intake of fermented drinks and herbs—like dried ginger and honey—is particularly recommended for this season. Turmeric will boost the immune system, purify the liver, and reduce inflammation, common in most allergic reactions. Check out the Turmeric Tea Recipe that can be taken daily, even several times a day. Fresh Cilantro (coriander) juice and Aloe Vera gel drank throughout the day can cool hay fever symptoms. Ginger & honey are also immune boosters with anti-inflammatory properties. Any green is good but Dandelion, Thistle, Kale & Swiss Chard are very available in the spring and can be added to salads, smoothies & juices. Get into a more vigorous style of yoga or movement that makes your body happy. Spring is the time to really challenge yourself to get out there and sweat. The main idea is to eat light (bitter, astringent, spicy) foods that clear out excess mucus and moisture from the body. You’ll want to reduce “kapha-aggravating” sweet, sour and salty foods which could cause water retention this time of year. I’ve been experimenting in the kitchen with some Ayurveda recipes. Tried this one this morning and it came out spectacularly more tasty than I was expecting. It’s the perfect Saturday or Sunday morning start or it could be served for lunch when digestion is at it’s highest and best. It’s a wonderful recipe for a group of people or the entire family. Mine LOVED it! I snapped this picture before it all disappeared. They key to Ayurveda cooking is to prepare meals in a way that what is good for your particular imbalance (if you have one) or eat foods that are nourishing for your own unique constitution. Imbalances can be anything from being overweight, chronic or acute allergies to deeper chronic imbalances that include serious diseases. Your constitution is called your dosha in Ayurveda. It’s what makes you, you. And each of us is different. That’s why there is no single diet that works for everyone. There are quite a few online tests you can use to determine your constitution but it’s always best to meet with an Ayurveda Wellness Counselor to get an accurate view of what foods are best for you. Ayurveda also takes into account, your daily lifestyle (exercise, sleep, daily routine, relationships, etc) and the season. For example, in the winter, things tend to be cold & dry outside therefore we need more warm, cooked, grounding foods. This recipe can be altered according to season, your dosha and your imbalance if needed. This can be used as a breakfast or lunch. As breakfast, it’s a nice change up or for special days when you have the family together and want a little more brunch style food. 1/4-1/2 cup Almond Milk (homemade & unflavored), Cow’s Milk OR vegetable broth. I use vegetable broth and it’s delicious. Put the vegetables and 1 TBSP water in a frying pan, cover tightly and steam/sautee at medium heat for 7-10 minutes or until tender. Melt ghee in an 8-10 in. skillet (cast iron works great) on medium heat. In a bowl beat eggs, spices and milk or vegetable broth for 1-2 minutes. Pour the egg mixture into the skillet and distribute vegetables evenly over the egg moisture. Cook over medium heat until eggs are almost set – 8-10 minutes. Cover and cook for 5-7 minutes more or until eggs are completely set. To serve, cut into wedges while still in pan. You could add steamed greens or soup if serving for lunch and the Winter Digestive Tea (recipe below) is a wonderful complement to the Frittata. I added in some sliced olives and a small bit of leftover goat cheese that I had in the fridge. Just fyi…most Ayurveda recipes don’t call for cheese but goat cheese has warmer, lighter qualities than cow’s cheese making it perfect for a winter addition every once in awhile. Egg whites can be used if you tend toward an acid stomach or when there’s too much weight on the body. Eggs are cooked with a pinch of turmeric and black pepper to help the body digest the heavy egg yolk. A warm, baked egg dish is preferable to cold hard-boiled egg or eggs fried in lost of oil. In general Ayurveda considers eggs to increase heat and excitability. Thus, they are not recommended for daily consumption but 3-4 times a week if digestion is at it’s best is fine. This tea is a true winter warmer. Cumin is known for it’s ability to help the body eliminate mucus – especially helpful in the winter when mucus starts to accumulate. Bring two cups water to a boil in small saucepan. Coarsely chop the gingerroot and add to the water. Add the rest of the spices. Cover reduce to a low heat and simmer 10 minutes or more if you want a stronger tea. Strain into mugs for serving. Take 6 ounces with or after meals.